Everything you need to properly restore faded trim! If you drive a vehicle manufactured in the last thirty years, it has plastic trim! Plastic trim is used on the windshield wiper cowl, bumpers, roof racks, and various other exterior surfaces on your vehicle. Plastic trim looks great when the vehicle is brand new, but after a few months it begins to fade and discolor. The McKee's 37 Total Plastic Trim Restoration System arms you with "the good stuff" to clean, restore, and protect even the most neglected plastic trim. Stuff happens. It's so easy to accidentally get wax, compound or polish residue onto plastic, rubber and vinyl trim surfaces. What takes only a few seconds to do can take hours to remove and then you never really get 100% of the residue off leaving a white stain that bothers you every time you look at your car. McKee’s 37 Wax Remover for Plastic erases 100% trace residue of ALL polish, compound and wax residue on rubber, vinyl and plastic exterior trim. And it does so QUICKLY with minimal effort. McKee's 37 Wax Remover for Plastic is also ideal for removing water spots from window trim. 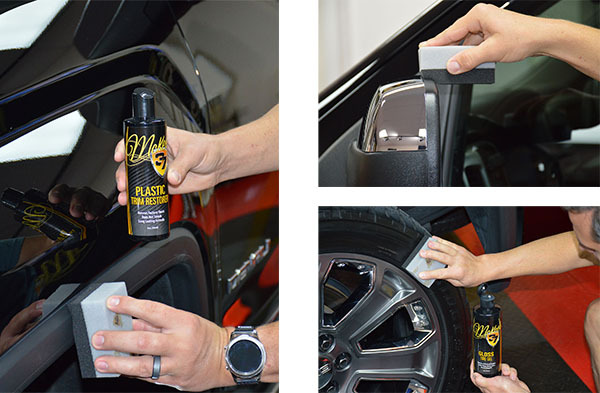 McKee’s 37 Plastic Trim Restorer is the car care product you’ve been waiting for! What is arguably best described as magic in a bottle, McKee’s 37 Plastic Trim Restorer injects new life into old, faded, discolored exterior plastic trim. Do you think the chalky, faded plastic trim on your vehicle is too far gone? Think again. McKee’s 37 Plastic Trim Restorer will make it look new again by restoring a rich, black appearance! Best of all, it only takes minutes to apply, yet the results are long lasting. Use this soft-bristled brush to gently agitate Wax Remover For Plastic. It is perfect for softer plastic surfaces that would otherwise be scratched or marred by the stiffer Low Profile Scrub Brush. The wooden handle will not get slippery when wet. Total retail value of $75.89; You save $25.90! Great Product 5 Best product I've ever used. I've tried many and even suggestions from pro's on how to remove wax from trim but your product is amazing. It removes wax easily and the restorer makes it look showroom again. 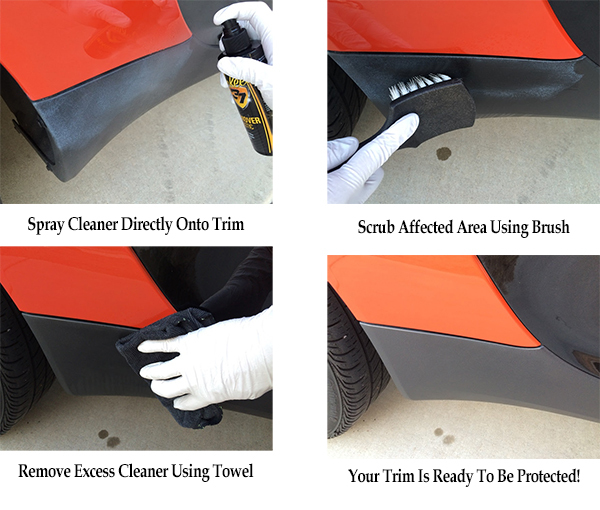 Plastic Trim Restorer Review 5 Fantastic product. I used on my new 2018 Honda and my 2010 Mustang Convertible and my 2015 Ford Edge. All the time the plastic looked bright dark and clean. Even after washing and a rain! Superior product to anything else I have used. Cons:The bottle needs to have a better seal as it tends to run and the bottle becomes slippery. Plastic trim restore 4 Saw this product on TV. I have 2 used vehicles, I have bought in the last year, an 09 and 012, which have plastic trim in several areas. On the 012 the trim did not look that faded, treatment did not make much difference . I"am hoping it slows the fading in the future. On the 09, it worked great to the door handles, but on the rocker trim, which was faded it didn't do much. Maybe it was already too faded.